Canadian marine transportation company Desgagnés is the proud new owner of a 5th dual-fuel (diesel/LNG) oil/chemical tanker, the M/T Fure Vinga, soon to be renamed M/T Gaïa Desgagnés which was sold by Swedish shipping company Furetank Rederi AB. Built in April 2018, this 16,300-ton double-hull vessel, 150 meters long and 22.8 meters wide, holds an ice class 1A and can carry nearly 20,000 m³ of cargo in its tanks. She is also equipped with a bow thruster and a high-efficiency rudder, providing exemplary safety during manoeuvres. 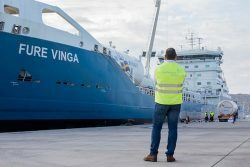 The previous owner has already ordered a replacement vessel for the Fure Vinga, which was the first of six dual-fuel vessels for fleets of the Gothia TankerAlliance. The Gaïa Desgagnés, 5th vessel using liquefied natural gas as fuel to be integrated in the Desgagnés fleet since 2017, joins the first 4 which were designed and built specifically for the company. She also is part of the company’s major fleet renewal plan, started a few years ago, confirming its commitment to better serve its customers and demonstrating, in a tangible way, Desgagnés’s vision and leadership in sustainable development. In fact, these dual-fuel vessels allow the company to maintain its stride aimed at reducing the environmental footprint of its fleet to a level unparalleled in Canada. The acquisition of this newly-built ship also allows Desgagnés to assert its expertise in the operation of technologically advanced vessels, as well as its headway in the operation of dual-fuel systems. The Gaïa Desgagnés, currently in Europe, will arrive in Canada by the end of April for the closing of the transaction, at which point she will be fitted out with Desgagnés colours and begin her operations by mid-May.Able to sail worldwide, she will primarily carry refined petroleum products on the Great Lakes, the St. Lawrence, the Arctic and the East coasts of Canada and the United States.